For all consultations, except in emergency, you will need to be referred by your GP. A guide to waiting times and other information can be found on the NHS Choices website (use the 'Services near you' tab). 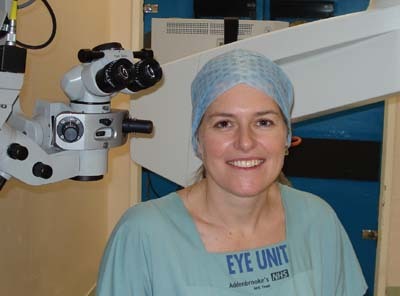 The Eye Department at Addenbrooke's Hospital offers an exceptionally high quality of care. Patients are drawn mainly from the Cambridge area and the unit is also a specialist ophthalmic centre for patients from across East Anglia and beyond. The range of specialties includes paediatric ophthalmology, genetic eye disease, orbital and lacrimal surgery, medical ophthalmology and vitreo-retinal surgery. Care is provided in a dedicated ophthalmic ward and surgical theatres and the Cambridge Eye Unit, a state-of-the-art day case treatment centre which opened in March 2009. I run regular paediatric outpatient clinics and undertake paediatric ophthalmic surgery. In addition, I hold a regular multi-disciplinary genetics clinic, working alongside a consultant geneticist, retinal electrophysiologist and genetic and low-vision counsellors. Patients and families with inherited eye disease (such as retinitis pigmentosa, aniridia and albinism) attending from across the region are offered diagnosis, advice and counselling. If your child's GP is based in or near Cambridge, an appointment with me or one of my team will be arranged at Addenbrooke's but, depending on your address and the nature of the problem, it may also be possible for your child to be seen by one of my team at Saffron Walden Community Hospital. If your child's GP is not based near Cambridge but you would like your child to be seen by my team, you should ask your GP to make the referral to me at Addenbrooke's Hospital. More information about the Children's Eye Service at Addenbrooke's can be found here .